The Mighty Bright LED Floor Light and Magnifier is a flexible combination of a large magnifier and 12 Super LED lights at tabletop height! 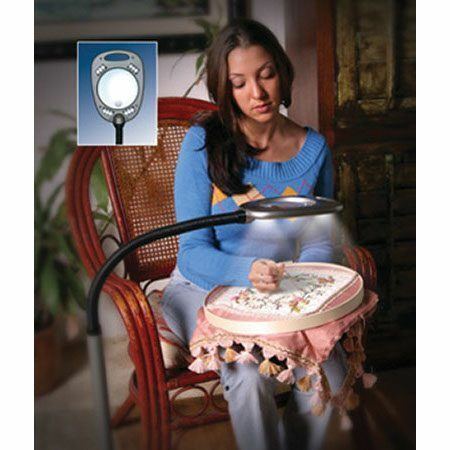 Perfect for crafts, hobbies, reading or any activity that requires improved illumination and fine detail. Magnifier is 5" wide with 2x power; bifocal magnifier is 1" with 5x power. 4" base, 24" solid neck, 17" flexible neck for a total height of 54". Fully portable w/3 size D batteries, not included. 6' AC power cord included. Easy to assemble, no tools needed!